• Brian Goodwin (’12-’13) was the lone Nationals’ farmhand named to the Arizona Fall League 2013 Top Prospects Team. 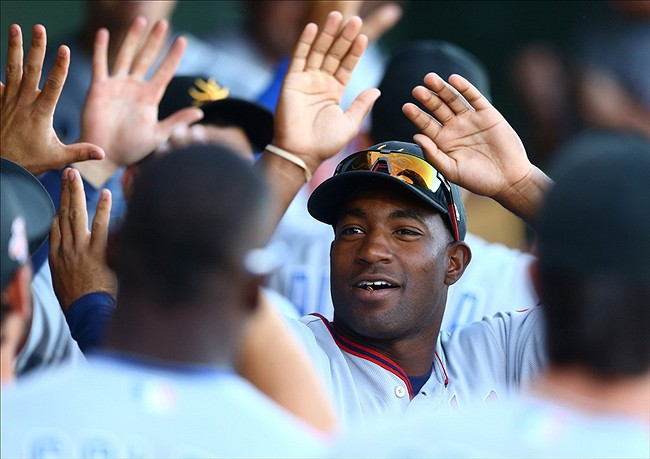 In 19 games in the AFL, Goodwin hit .296 with four doubles, a triple, two home runs and three stolen bases. • A couple of former Senators are drawing interest on the free agent market as the Rays, Rangers, and Indians are reportedly pursuing Jamey Carroll (’98-’00, ’02) and Ken Rosenthal highlights Jerome Williams (’07) as a buy-low candidate who is more durable than some on market. • Erik Arnesen (’09-’11) requested and was granted his release from the Venezuelan Winter League’s Tigres de Aragua with a case of tendinitis in his right knee. • Perhaps best known for his on-field meltdown in 2007, Phil Wellman (’87) was hired by the Angels as their Double-A manager of the Arkansas Travelers. • If you haven’t been checking out Senators’ GM Randy Whitaker’s blog of the annual Winter Meetings over on PennLive, click here to get a glimpse into the daily goings on. This entry was posted in Roll Call and tagged Brian Goodwin, Erik Arnesen, Jamey Carroll, Jerome Williams, Phil Wellman, Randy Whitaker. Bookmark the permalink.